Ever since I first stepped into the Tate Britain on Millbank, I have been under the spell of the Pre-Raphaelites. It has been almost 20 years since I first glimpsed J.W. Waterhouse’s The Lady of Shalott but I still slide into a mini trance when I look upon her face. I am also captivated by Edward Burne-Jones’ Beguiling of Merlin and go crazy over anything William Morris. The Pre-Raphaelite Brotherhood was formed in 1848 by William Holman Hunt, John Everett Millais and Dante Gabriel Rossetti. Their manifesto was to reject the classical artistic style and aesthetic of the last three hundred years and return to the style prior to that of Raphael – hence their name. They focused on nature, capturing the brilliant colours and detail they found around them together with complex poses. 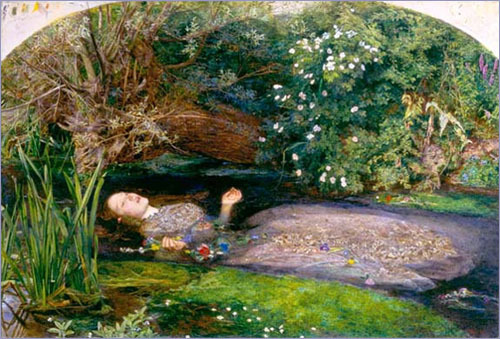 Millais’ Ophelia is such a study of death surrounded by the beauty of nature. Who could resist the romance of the stories their painting told and the allure of their muses? I have often wondered whether the Pre-Raphaelites were only a small, local group, as there were hardly any exhibitions, articles or programmes about them in the last twenty years. But 2009 seems to be all about the Pre-Raphaelites. BBC4 aired a three part documentary about them in June this year and is followed by a six part historical drama series Desperate Romantics on BBC2 in July. The cast is luscious and the script is spot on, drawing out the excitement and energy of the young artists. And to top it all, this summer there is J.W. Waterhouse – the Modern Pre-Raphaelite, an exhibition at the Royal Academy. I know, I know, Waterhouse, Burne-Jones and Morris weren’t original members and are only loosely connected to the brotherhood, but they embraced the aesthetic and are generally included in the movement. Right now, I feel like I’m drowning in Pre-Raphaelites. Definitely worth waiting twenty years for.